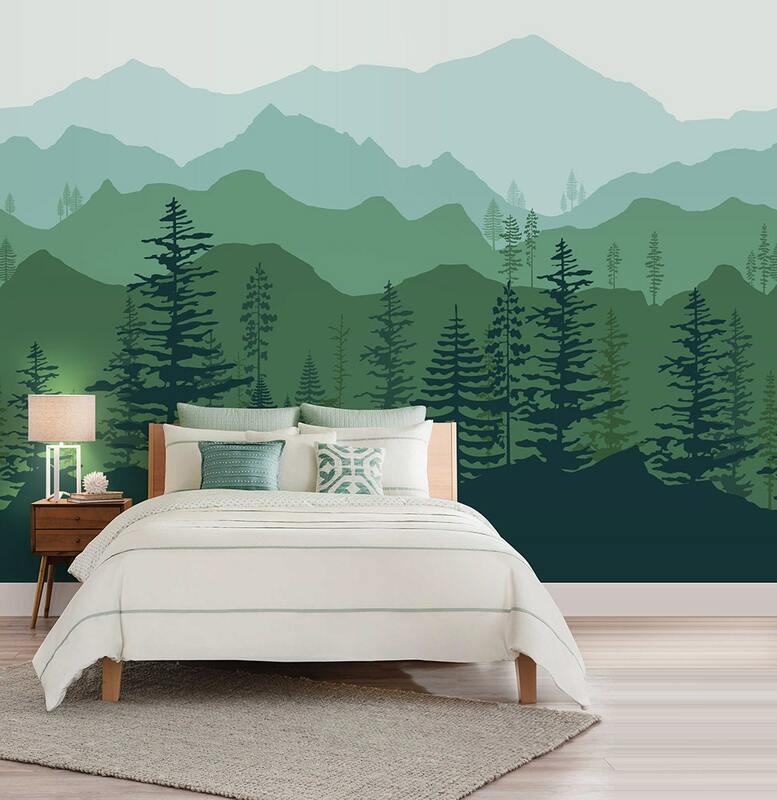 Ombre Mountain Scenery with Pine forest trees wallpaper. Can be made to match your desire color scheme. This wallpaper comes with adhesive ready, you can transform your wall instantly, easily. * Semi gloss, satin, sheen, eggshell and all types of easy to clean type of wallpaint will be harder for the wallpaper to cling on. * Our decals can be applied on slightly textured walls except heavy grainy or sandy type of wall. Please ask us to help, if you are not sure of your wall is suitable. Each roll covers 23”wide of your wall, if you have wider wall, please add more quantity/roll to your cart before checkout. You can choose the color option you like from the dropdown list. If you need other color which is not listed, please contact us for a custom order. I can make the design in your desired color scheme, just send me a message. If there is no color request on your order and no email received in regards to specify color then the design will be created and shipped in default color as shown in the main picture. Once order is place and paid it cannot be cancelled, please confirm before you make payment. All my orders are shipped with Registered Priority Air Mail within 2 ~ 5 working days from full payment received. Normally orders are delivered within 6 ~ 8 working days for US/ CA/ AU and up to 20 days for APO, PO box and remote area address. During festive seasons and other busy postal periods and weather delays it can take longer for a package to be delivered. Every order will have tracking number except orders to APO, PO box or Remote Area address. ** No shipping to International PO Box address. I hope that my customers will love my product. If for any reason you're not fully satisfied with your purchase please let me know and you can return your order within 7 days for full refund. Item must be unused, in original size, and original color (default) shown online. Custom order is not eligible for return. Shipping fees are not refundable. Need help with sizing and color to fit your wall and match your color theme? Just contact us, we can provide visuals and help you on your project to make it a perfect one. All artwork is original. Use of our photos is strictly prohibited. © 2016 atelierbishop. All rights reserved. The wallpaper is beautiful and relatively easy to install. Unfortunately we had some issues with the wallpaper sticking because of the type of paint on our walls. However, the seller was extremely helpful and worked with us to find a solution. I would definitely recommend doing business with AtelierBishop! In LOVE with this gorgeous wallpaper for our son’s nursery!!! !